Yes, readers, your wish is my command, and at Laird Sapir‘s request, this week’s psych patient is Alaric Saltzman, history teacher, vampire hunter, guardian, murderer, and all-around interesting guy from The Vampire Diaries. Um, yes. Yes it would be weird. But I digress. Here’s the normal disclaimer: this post is about the CW show The Vampire Diaries, not L. J. Smith’s series of novels by the same name. He will always be Warner Huntington III from Legally Blonde to me. Alaric shows up on the show as a history teacher, mysterious vampire hunter, bitter widower, and love-interest for main-character Elena’s aunt in season one. We learn that Alaric’s wife, Isobel, died a couple years before, murdered by Damon Salvatore—or WAS SHE? No. She was not. She was, in fact, turned into a vampire at her own request. We also learn that she had an affair with Elena’s “uncle” John, and that Isobel and John were Elena’s birth-parents. (Confused yet?) So that makes “Rick” Elena’s… step-birth-dad? 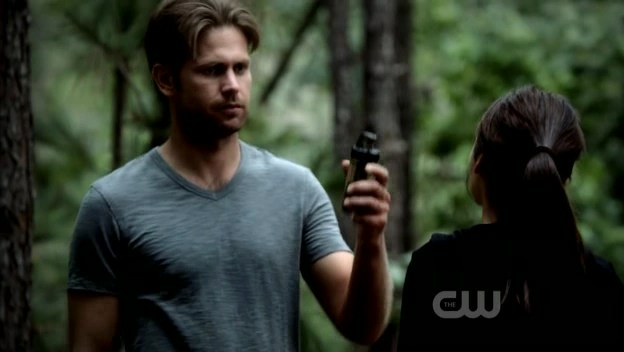 When Elena’s aunt dies, Alaric sticks around to act as guardian to her and her younger brother (cousin? ), Jeremy. Rick makes friends with Damon Salvatore, joins the Founder’s Council, and overcomes his issues enough to become a decent guardian for Elena and Jeremy. It’s more complicated than that, though. He’s briefly possessed by an evil vampire, his (first) girlfriend becomes a vampire before she dies, his “friend” Damon kills him a couple of times, and his new girlfriend reveals that his protection-against-the-supernatural ring is actually giving him a second personality that prowls the town and kills other members of the Founder’s Council. So here we have a man who hated the vampires because they fascinated his wife and, to his reckoning, killed her. Then he gradually learns that vampires are people, too. In a super-sad scene from season one, he confronts Isobel without his supernatural protections, trying to prove he trusts her, in spite of what she is, and she compels him to move on and forget her. She later kills herself. He opens up, shows his vulnerabilities, and promptly gets passively stomped on. He finds a group of trusted friends and adoptive family, and then an evil vampire uses him to infiltrate their defenses. His wife gave him a ring to protect him, but that ring is turning him into a vicious killer. If that doesn’t teach him not to trust a good thing, what will? Relationship-wise, his wife chose to become a vampire and abandon him. His first girlfriend became a vampire (not by choice) and then died. His second girlfriend is trying to protect him—and his alter-ego stabs her. His best relationships are with Elena and Jeremy, two kids he’s not even related to, and Damon Salvatore, a frenemy if ever I really saw one. Alaric protects Elena and Jeremy, and he trains Elena to protect himself, satisfying that apparent need in him to do something good, to take control in a world where supernatural rules and humans have few defenses. Teaching Elena to defend herself. His friendship with Damon is mutually self-destructive: everything I touch dies, and you kill everything you touch, therefore we must have something in common. It also crystallizes his relationship with the supernatural: he likes it, he’s willing to work with it, but he hates it a little, too, and it will kill him at a moment’s notice. So how do we reconcile Alaric’s need to protect the weak and fight against the supernatural with his fatalistic attitude that he cannot do anything right, and that everything supernatural is tainted? He fights against the supernatural, but he relies on it to protect himself, setting him up for a confusing simultaneous hatred and reverence. Elena’s friendship saves him several times: she has faith in him, even when he doesn’t. And his desire to protect may overcome his tendency to despair. But what will he do now that he cannot even protect himself? Will he overcome his backwards-reverence of the supernatural now that he cannot depend on a magical ring to save him? Will he finally own his natural, human talents and accept himself as a strong human who has fallen victim to the supernatural, but can overcome it? What do you think, readers? What’s Alaric’s trouble? Have you even thought this much about him? And would it be weird to be a thirty-something guy living with a hot 18-year-old girl? One thing about Alaric that I have wondered about for the last few episodes is: how did he survive getting shot to death by Meredith? The ring? Because the ring only protects him from supernatural deaths. And as far as we know, Meredith is just a regular ol’ person. Or was he not shot to death, just shot, and so he never died in the first place? Did I miss that? As for him living with Elena, I don’t think its weird, haha. He was into her aunt, not her. And yeah she’s attractive, and he has probably noticed, but it would be waaaay to awkward to ever try anything, so I think they’re safe. I also liked your point about how he hates the vampires but now also relies on them. Very true, and an interesting depth to his character.